Who doesn’t love Peppa Pig? 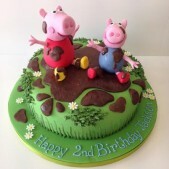 It’s no surprise that Peppa Pig cakes are one of our most popular requests! 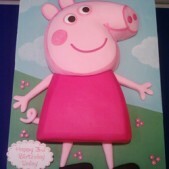 Peppa Pig and George Pig are much loved characters and it’s not hard to see why. They’re cute, cheeky and mischievous and we are just as smitten with them as the kids! 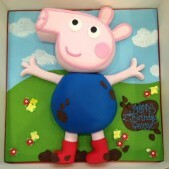 If you have a Peppa fan amongst your family, then a Peppa Pig cake is an absolute must. 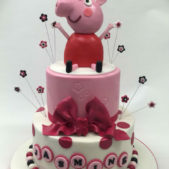 Select from our huge range of Peppa Pig cake ideas to suit all budgets and sizes from transfer cakes to fully-sculptured hand-crafted masterpieces. 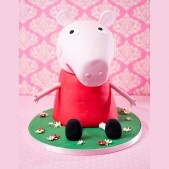 Whatever your little one’s favourite Peppa character, we can bring them to life in cake form. Whether it be Peppa, George, Mummy Pig, Daddy Pig, Pedro Pony, Suzy Sheep, Rebecca Rabbit, Zoe Zebra, Emily Elephant, Delphine Donkey or even Mr. Bull. 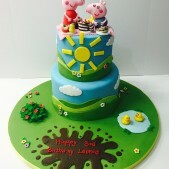 This pre-school favourite remains an all-time Cakes by Robin top requested cake and we never tire of seeing the glee on each child’s face when presented with their Peppa Pig cake surprise. 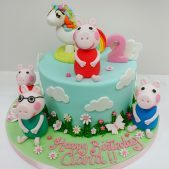 Contact our cake team now and get your Peppa Pig cake surprise on order. 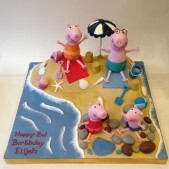 If you’re planning a Peppa Pig themed birthday party, why not combine your Peppa Pig birthday cake with some Peppa Pig cookies, cake pops and cupcakes. 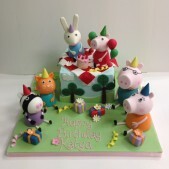 We can customise dessert tables to include a full range of sweet Peppa Pig treats! 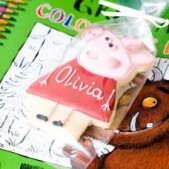 And our cookies and cake pops make perfect party bag gifts for little guests to take home. 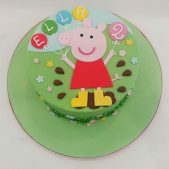 Our Peppa Pig dessert tables are a real party showstopper and will delight your adult guests just as much as the children. At Cakes by Robin we love to turn unique ideas into cake form. 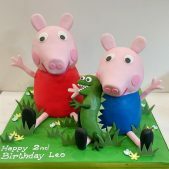 If you have a Peppa Pig cake idea or any other characters you would like to add to your Peppa Pig themed cake, just tell us and we’ll work our magic. We are experts at bringing cake ideas to life. If your little one has a favourite episode tell us all about it and we’ll replicate a scene to make your son or daughter giggle with joy. At Cakes by Robin we make cakes that aren’t just a feast for the eyes, they are just as delicious too. We can make cakes in a range of flavours and fillings to satisfy any sweet tooth tastes. Choose from yummy chocolate fudge, delicious vanilla, marble cake, red velvet, rainbow cake and lots more. Don’t panic if you have any gluten-free guests. 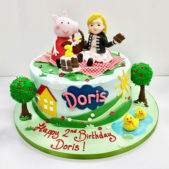 We can make the whole cake completely gluten-free or make a separate little replica to ensure everyone can have their cake and eat it on party day! The price of our cakes depends on the design you choose. All elements are made by hand and priced according to complexity. For example, a cake to feed 15-20 portions with a sugar model of a character on top will be in the region of £145. We can deliver any of our cakes and sweet treats to locations in and around London. Delivery charges are calculated according to postcode and there is an incremental supplementary fee for deliveries outside of London. You can of course collect your cake from our cake parlour just a couple of minutes’ walk from Southfields tube station during our opening hours. For a map of where we are and more about our delivery charges, see here. 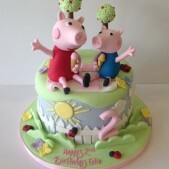 For more Peppa Pig cake inspiration, read our Pig out on Cakes blog! 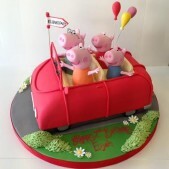 Why not make your little one’s next birthday party the perfect Peppa Pig surprise?